National Socialism values the individual personality above all. This may at first glance appear contradictory to the National Socialist position that demography is destiny, but upon closer inspection is in fact part of the same position. It is the individual who introduces the potential for positive change (negative change requires no individual inspiration), and then it is demographics which determine the extent to which this potential can be actualized. 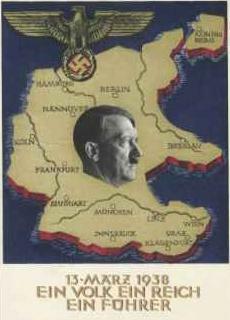 As Hitler asks rhetorically: “Does anybody honestly believe that human progress originates in the composite brain of the majority and not in the brain of the individual personality?” National Socialists view all of history as a moral struggle of rare individual heroic idealists in opposition to traditionally popular norms. Aryan racial theory merely adds the proposition that these idealists are who they are by blood. The word “folk” etymologically derives from the word “follow”, and hence has the same meaning as the present-day word “following” (noun) as commonly used in pop culture to describe a fanbase of a particular icon. The state in this worldview is simply the totality of the mechanisms that most efficiently allow the leader’s following a.k.a. folk to assist in the expression of the leader’s personality. And, just as the true die-hard fan lives up to his name by psychological readiness to die for his icon without question and at a moment’s notice, the true political individualist is similarly ready to die for his leader. It is no coincidence that National Socialism is aligned with youth (“The Hitler Youth has taken his name. It is the only organization in the Reich that does bear his name.” – Joseph Goebbels), as fan passion is most closely associated with youthful enthusiasm and declines with age among most people. Original Nobility is what a true leader is supposed to represent. To further elaborate on the spirit of radical individualism, one who sincerely wishes to see individuality maximally expressed can feel no urge to follow anyone who does not indeed possess an outstanding individual personality. Thus a leader in the individualist worldview is never a traditionalist, and a follower in the individualist worldview is also never a traditionalist, for traditionalism only appeals to those who lack reverence for individuality. A radical individualist wishes to see individuality expressed always and only ever in opposition to tradition, the latter being invariably determined by the norm rather than by the exception. Furthermore, a radical individualist defines personality always and only ever as opposition to identity (“Personality (will plus reason) is a power representing the spiritual in man opposed to the material. … Persona (instinct plus understanding) is the body of man and his interests.” – Alfred Rosenberg), the latter being invariably determined by pre-existing roles into which we are placed without our own consent rather than by our own sincerity of spirit in absence of pressure to meet expectations. Thus a good measure of individual personality is the extent to which it scorns confinement by tradition (identity being one aspect of tradition), so that a shallow personality is anti-traditional only in superficial ways, whereas a deep personality is anti-traditional in the very fundamentals of its thought. (“True personality at first hostilely faces the object to be altered, then the latter is forced to answer to a formal will. When this occurs, personality style is the result.” – Alfred Rosenberg) As such, so-called “traditionalist leaders” are not leaders at all in our eyes, but mere paternalistic mediocrities, or – more bluntly – slave prefects. Radical individualism – “individualism for the leader alone” – thus simultaneously opposes both the phony “individualism for everybody” of the modern False Left, and the “individualism for nobody” traditionalism and paternalistic authoritarianism of all right-wing ideologies, and as such is an attitude exclusive to the True Left. Classical Platonist ideas about a “philosopher-king” come close in form to our conception of leadership, but Romantic-influenced National Socialism hits the deeper mark by visualizing the leader as less a philosopher and more an artist, hence further emphasizing the importance of individual personality. Hitler was precisely such a leader, and National Socialism was a movement by and for people with artistic sympathies – the comparison between a National Socialist leader and a pop culture icon becomes even more analogous with this in mind. Such a leader must not be concerned about his own popularity among his followers, or else he would have ceased to be leading his followers and degenerated into doing whatever they want him to do, and thus ceased to be a leader (or even an individual) in any meaningful sense. Instead, as an artist, the leader’s only duty is to stay true to his artistic vision. It is inaccurate to describe such a leader as a tyrant, as he does not force anyone to serve himself – the very notion is as nonsensical as the notion of pop culture icons forcing anyone to be their fan. In a practical world of many countries and many leaders, all followers should be allowed to choose to offer their services to whichever leader they prefer, and to physically relocate to the corresponding country as necessary in order to serve their leader of choice alongside the rest of their folk. It is mutually beneficial among leaders to facilitate such a process of free relocation by aspiring followers, as it will match every leader with the followers most loyal to himself. One who believes that he himself can be a better leader than any currently existing is also open to try becoming one via his own means. Only after an oath of loyalty is freely taken by a follower does he become honour-bound to serve the leader until death or until the leader releases him from his oath. It is democracy which is tyrannical by forcing large numbers of citizens to tolerate elected governments towards which they feel no loyalty, based on the excuses: 1) they lost the vote; 2) they can vote again in a few years’ time.